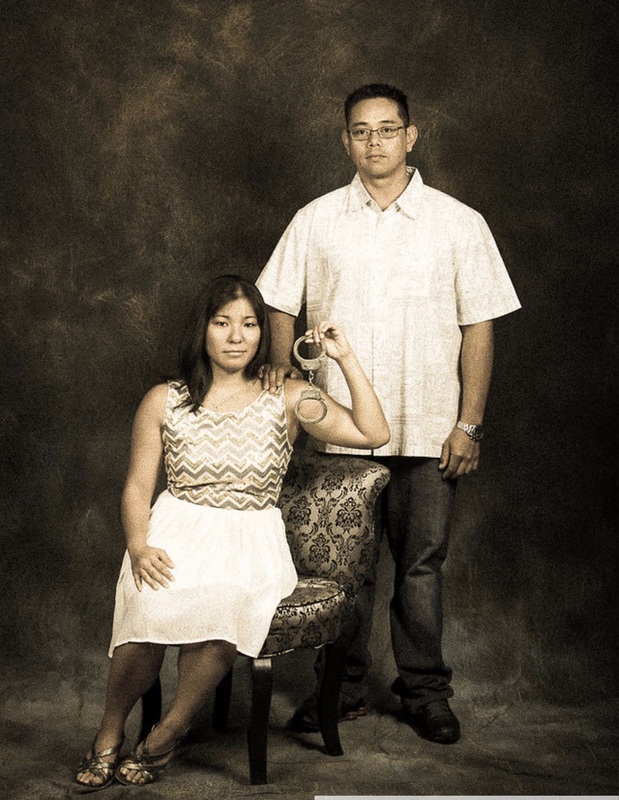 About a year ago I wrote a post commenting on the outrageous cost of a Hawaii wedding. At that time, the local paper was calling Honolulu weddings among Hawaii's most affordable (based on household income) at $52,190. I don't know about you, but that's more than I bring home in a year. 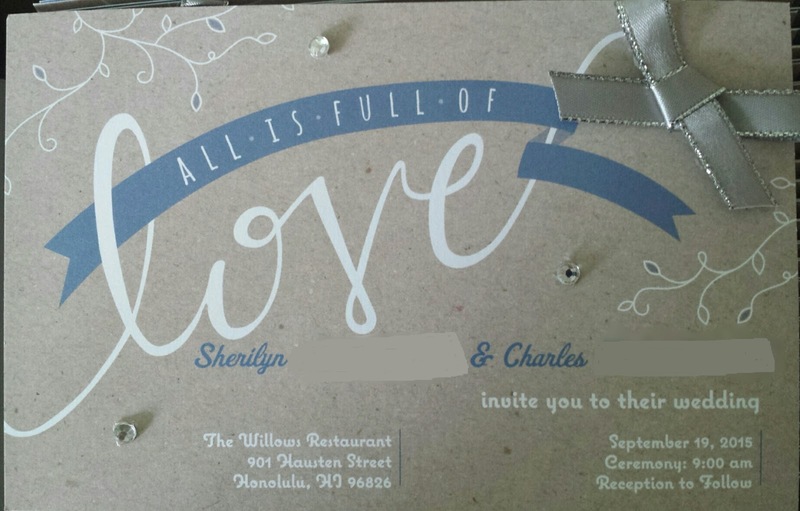 If you're lucky you might be able to convince your parents to help foot at least some of the bill, but mine insisted that you can make a wedding ceremony and reception happen for under $5K (hello, what decade are you in?) and my husband's folks said that if they help fund ours then they'd have to help finance his two younger brothers' weddings. In other words, we were on our own. That automatically meant that the pricey hotel ballrooms were out of the question. Instead we settled for a cozy restaurant with a koi pond. We thought that'd make for some pretty pics. The total cost per head? Thirty dollars. It fit right in with our price range. Score!! 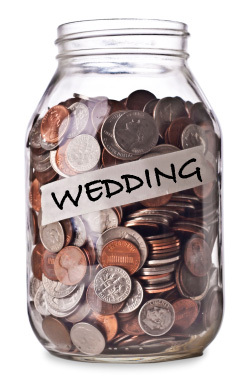 The first thing we agreed upon before starting any wedding planning was our budget. We knew we couldn't afford the national average of ~$30K without any help so we cut that number in half. We had a year to plan and $15K sounded doable enough without us worrying about incurring debt. That number would include tips (roughly 20%) so that meant we had to aim to keep our costs below $12K. I had also heard tons of stories about how it's virtually impossible to stay within budget so to ensure we didn't go over, I further cut that number to account for unplanned expenditures. Our new budget was $11,000 before tips. Once you get that stuff out of the way, you can move on to Tip #2. You'll need to stay on top of your game in order to stay under budget. To help keep track of our planning progress I made a ton of Excel spreadsheets. One for everything - budget, guest list, decor, checklists, wedding party responsibilities - you name it, there was a file. To help streamline access, I capitalized the names of files that I updated the most. 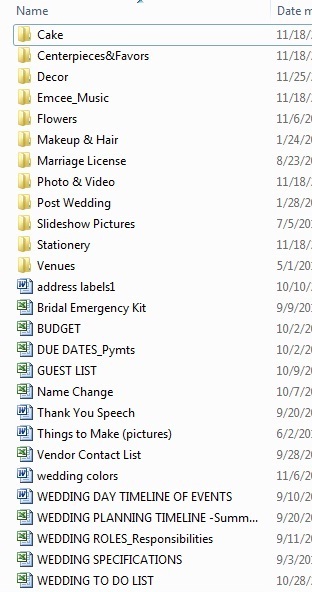 My most-updated file was Budget, which was a record of all of our wedding-related expenditures. The more aware I was of where we stood on our budget, the less I felt the urge to splurge on fancy frills. 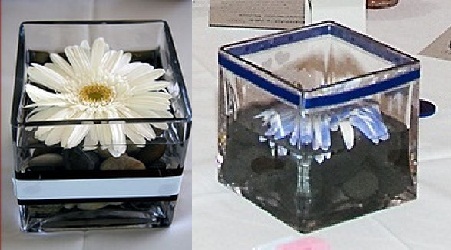 Let's face it - every bride wants their dream wedding reception but most of us can't afford one. To me that meant getting rid of all the accents that make a wedding, well, pretty. In other words we had a plain and simple reception setup and made up for the lack of elegant decor with a kickass fun program. What did we cut out? First, we cut out the evening reception. Dinner is generally more expensive so we settled on a lunchtime celebration instead. Next we wanted to cut out the cake. Based on our past experience attending weddings, everyone's so full by the time cake is served that 3/4 of it gets wasted. Our buffet already included a dessert spread anyway. Besides, wedding cakes are freakin' expensive. 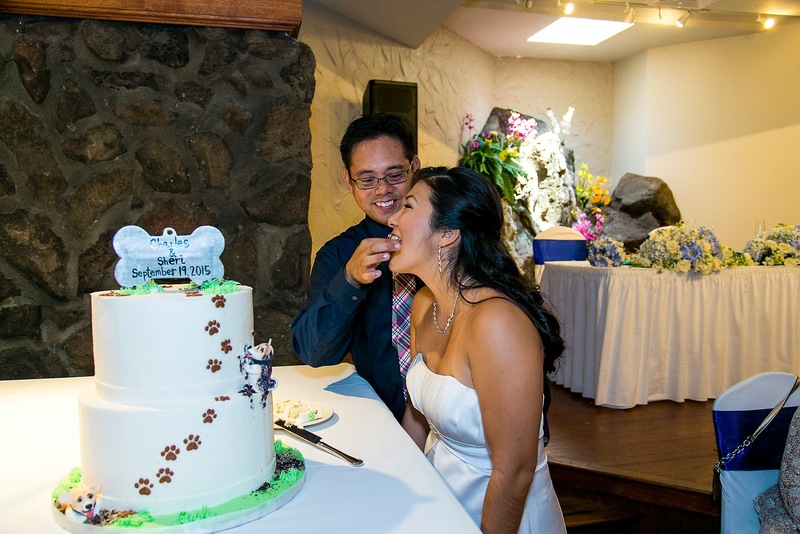 We had our minds set on no cake, but my mom-in-law loathed the idea of a cakeless wedding so much that two months before the wedding she offered to buy one for us. (Okay, so I guess we didn't pay for the wedding TOTALLY on our own) And when I say cakes can be expensive, I mean it. This two-tier cake was almost $500. We also cut out the limo service. We each drove ourselves to and from the wedding in our own cars. In addition, we had a no-host bar and substituted sparkling cider for champagne. We also relied on our families to shoot video instead of hiring videographers (but they forgot their camcorders so...fail). 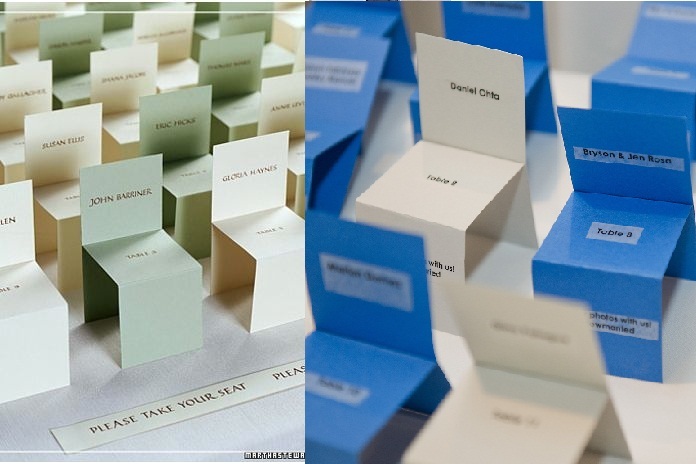 Oh, and by the way, this is also where you'd trim your guest list if you can. Fewer mouths to feed will save a heck of a lot of moolah. Part of the reason why you want to start your planning as early as possible is to give yourself ample time to wait for sales because they WILL happen. I ordered my invitations early - six months before my wedding - to take advantage of a huge Vistaprint sale. Each one was under a dollar! It did look kind of plain so I just picked up some rhinestones and ribbon from the craft store to dress it up a bit. Then came the dress. The price tag can vary here depending on how elegant you want it to look. I wasn't too picky because the way I saw it, I would only wear it once so why go nuts? (Of course, some may look at it as you're only going to wear it once, so you should make it count) David's Bridal had a $99 sale and I ended up getting a simple split-front satin dress for a hundred bucks. If you get the chance, I also highly recommend attending a wedding expo. Vendors are eager to get your business and will often have huge promos where they drop their prices as much as 50%. This will help big time when picking a DJ or photographer which can run upwards of $3000. Many vendors will also have giveaways and random drawings. We entered to win an engagement photo shoot (and won!) 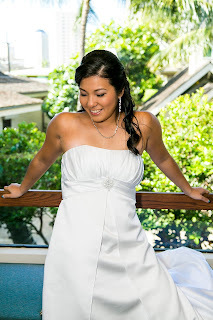 and loved working with the vendor so much that we ended up going with them for our wedding day. My favorite engagement pic ala Old West. Seriously, a photographer with ideas like this...how could we resist? Just make sure to do your research on any vendor who tells you that you won something. Some of them are scams. First of all, be sure that you actually entered to win something from them. Also make sure that the "free boudoir shoot with $100 off your photo album" doesn't mean that the album was actually $1000 to begin with (yup, I got one of these in the mail). 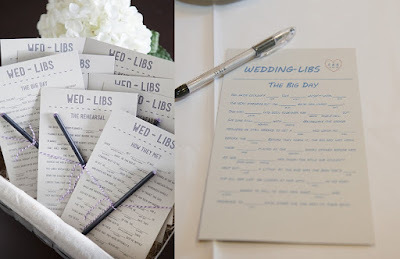 Mad Libs favors. Cheap AND fun! Bonus: These rope words now adorn my bookshelf at home! A huge unforgettable milestone kind of day, but nonetheless, it's just one day and it's gonna be over in the blink of an eye. Every time you find yourself wanting the biggest and best of celebrations, ask yourself if you'll remember giving everyone those mini aquarium favors ten years from now. Or if people will remember the personalized aisle runner. The last thing you want is to start your new chapter in debt. C and I agreed early on that we would not take out a loan for the wedding because we didn't feel it'd be worth it to spend the next five years paying it off. But of course, if a loan is the most sensible route for you, go ahead and do it; just be sure you'll be able to make the monthly payments. Be practical, but don't get hellbent on being frugal about everything. As Meg Keene suggested in her book A Practical Wedding, choose one thing to splurge on and try to save on the rest. For us it was the emcee. Since our wedding didn't have all the bells and whistles, we wanted a fun emcee who could keep the crowd entertained the entire time. Sure, we had a fun program planned out, but it takes a special kind of person to pull it off without boring anybody. And that he did. At least a dozen guests came up to us after the wedding raving about how great he was. So there you have it. These are some of the guidelines I used to help me plan my own wedding for under $15K. 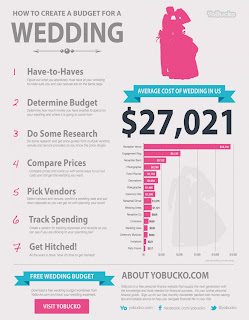 We didn't use a wedding planner, but if you have one she might have some other ways to help you save on costs (plus many of them have sweet hookups with vendors). Bottom line, whenever we made a sizable purchase we made sure to ask ourselves, "Is this really going to be worth it?" If the answer was yes then we went ahead with it. If not, we kept looking around. In the end we came in just under budget and celebrated our wedding knowing that we didn't have to break the bank in order to have the time of our lives. Ultimately, how you plan your wedding is totally up to you. You definitely don't have to follow all of these tips, but I hope at least one of them will help you save a bit along the way!